Former LSU offensive lineman Matt Branch reportedly had his leg amputated after being shot by a dog while duck hunting near Eagle Lake in Mississippi. According to Branch's friend, Micah Heckford, a group of friends were on an annual duck and deer hunting trip in Mississippi on December 28 when the bizarre incident occurred. "At approximately 9:40 a.m., David Joe, David, Matt and I were all standing around the bed of the (Polaris) Ranger and Matt had laid his gun down flat in the bed of the Ranger and walked around on the passenger side to finish loading up," Heckford said, according to reports. "I was at the tailgate no more than 4 feet away from him." That's when Tito, a Labrador retriever, jumped in the bed of the truck. The dog had stepped on the safety of Branch's gun and pulled the trigger, sending the 12-gauge shotgun shell through the side of the truck and into Branch's left thigh. When firefighters arrived they cut off Branch's waders and pants. 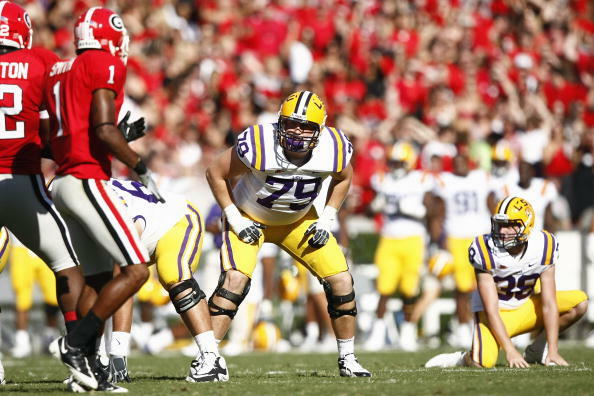 Branch, a three-year player at LSU from 2009 to 2011, has since had the leg amputated and is expected to recover, though he remains in intensive care, according to Heckford. A GoFundme account has also been set up in Branch's name to help with expenses.